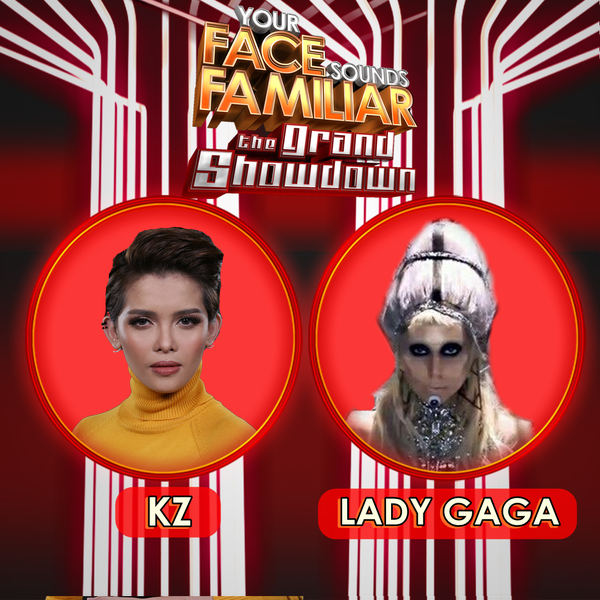 MANILA, Philippines - KZ Tandingan surprised the viewers as she impersonated the American singer Lady Gaga during the grand finals of "Your Face Sounds Familiar" Season 2 on Saturday, December 12, 2015 at the Newport Performing Arts Theater, Resorts World Manila in Pasay City. KZ wowed on her "Poker Face" and "Born This Way" performances. "Every week you surprise me, talagang you were born this way," Sharon told KZ. "You were born as amazing artist... that was just out of this world..perfect" Jed to KZ. "Yung ginawa mo tonight ay out of this world din..grabe yung ginawa... hanep pare." Gary Valenzuela commented. To vote for KZ, just text YFSF KZ and send to 2366 for all networks. The voting will open after all the Final 5 performers have performed. The other performers of the night included Sam Concepcion as Justin Bieber, Michael Pangilinan as Adam Levine, Denise Laurel as Beyonce, and KZ Tandingan as Lady Gaga. The grand winner of the competition will be announced on Sunday, December 13.